FOXBOROUGH, Mass. – Flanked by the men who hired him, newly-appointed head coach Jay Heaps spoke confidently about the immediate changes that need to take place in order to return the New England Revolution back to respectability. It’s been awhile since the Revolution regularly imposed their will on the competition. Since the club’s last postseason berth – back in 2009 – the team has only claimed 14 victories in their last 64 games. To say that a change was due would be an understatement. Recognizing that, the organization parted ways with longtime manager Steve Nicol and the search for a head coach that would act as a catalyst for change commenced. But even though the team spoke to a variety of candidates, Heaps shined as a leading candidate right from the start. Despite his lack of MLS coaching experience, Heaps’ understanding of the league was certainly to his benefit in the interviewing process. In the past, Nicol relied on the college drafts and the international waters to bolster his roster – with mixed success in recent years. With proven talent available within MLS, Heaps hopes to utilize his knowledge of the league to enhance – via trades, free agency, and the re-entry draft – the core group of players already in place and steer the Revolution back to the postseason. In addition to strengthening that core, Heaps also hopes to utilize some resources that his predecessor may not have invested in. Some of those resources include video analysis, advance scouting, as well as a new approach toward strength and conditioning. Another area he’d like to see the team improve upon is its propensity to attack – something the team seemed to shy away from at times last season, especially when holding a lead. Instituting these changes would be a challenge for anyone, let alone a first year head coach. But no man is an island. During Wednesday’s press conference, Heaps reflected on the coaches that have helped mold his coaching ideologies. The lessons learned from the likes of Krzyzewski, former Miami Fusion manager Ray Hudson, and Nicol will certainly guide Heaps as he endeavors into coaching. And while there will certainly be instances when Heaps will have no choice but to learn on the job, Burns is certain that his newest hire will rise to the challenge. 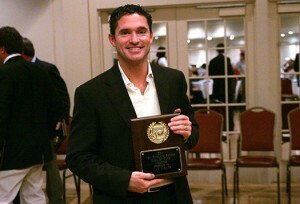 You are currently browsing the New England Soccer Hall of Fame blog archives for November, 2011.